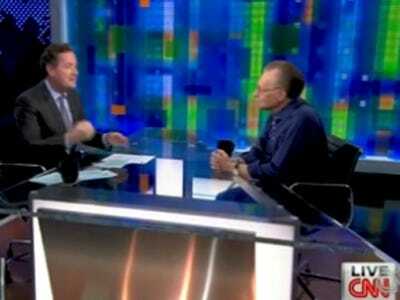 AWKWARD: Piers Morgan Confronts Larry King For Calling Him "Oversold"
Last week Larry King called his replacement Piers Morgan’s show “oversold” and “not that dangerous” in a radio interview with BBC. In fairness, if you listen to the whole interview it’s clear King wasn’t trying to be critical of Morgan, but that almost made his comments worse. So last night, when Larry King went on Piers Morgan Tonight for his much-publicized Morgan confronted him — and it was vaguely uncomfortable to watch. King defended what he said — but he didn’t back down. “But then it’s disappointing…” said King. Awkward! King, ever the professional, changed the subject. “So you told Letterman you were going to punch me?” he asked. Later in the inteview King attributed his falling ratings in the last year of his show to the fact television itself had changed: “The guest is the prop now” he noted, and the (frequently hollering) host is the main event.